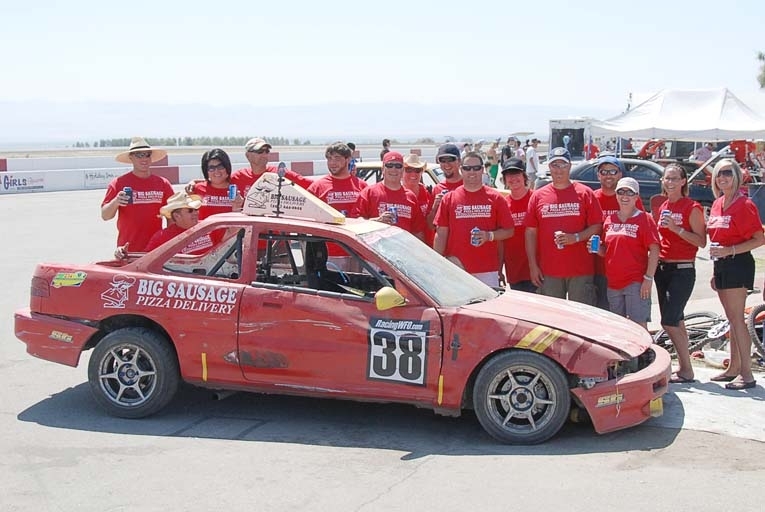 Krider’s Big Sausage Pizza Delivery team came in second place at 24 Hours of LeMons. In my early years of marriage, I made a lot of mistakes. I’m not talking about the usual stuff like leaving the lid up. I’m referring to the time I spent money we didn’t have on cars I shouldn’t have purchased. A young family doesn’t exactly need a used 1992 notchback Mustang 5.0 LX with a bad transmission. Child safety seats don’t fit too well in the back of a Mustang. Then, to add insult to injury, I would take the Mustang out and race it all over the state, leaving my wife and kids at home wondering if the transmission would hold up long enough for me to make it back. This did not make for a happy wife, which—as we married men know—leads to an unhappy life. Cut to a few years later when I started to wise up to the fact that my family wanted me home more. And when they wanted me home, they didn’t want me underneath the Mustang all weekend fixing the transmission. Instead, they wanted me underneath the sink fixing the garbage disposal. So to keep everyone happy (especially me, because I wanted to continue feeding my need for speed), I started to take the family along to the races. After a while, my wife, whom I love, began to enjoy some of the events. She worried less and less about me crashing—coincidentally after she took out a large life insurance policy on me. (“Go faster, Honey!”) She liked the races as long as her job was not to be a slave and feed me and my grease-covered friends breakfast, lunch, and dinner. The crew and I learned to live on a box of fresh donuts for breakfast, stale donuts for lunch, and (if we were nice to her) a fantastic dinner made by my baby. Of all the different types of races I’ve dragged my wife to, she has become most fond of the 24 Hours of LeMons series. This is an endurance race for $500 cars. Each car and team has a goofy theme, and as you would expect, most of the junky cars don’t finish the race. Some don’t even finish the first lap. This summer, we headed to a place where nobody will ever complain about loud racecars: Buttonwillow Raceway Park. The reason my wife likes this race so much is because part of the fun of the event is all the different teams and themes. The pits are a huge party mixing some Indy 500 flavor with the Burning Man festival. People drive around in golf carts decorated with tiki torches, and teams wear costumes to go along with their car. Specifically, one team had men wearing French maid costumes because their car was the Molly Maid housekeeping wagon. It was fishnet stockings with hairy legs. Not a pretty sight. It’s important for other teams to like you, because one unlucky team in the race gets voted as the People’s Curse (the team despised by the masses), and in the middle of the race their car is destroyed in an enormous ceremony of anarchy with people throwing lemons at the car. It is sort of a grassroots Cash for Clunkers program. The concept of the destruction is to keep people from bringing a car worth more than $500. My wife’s job this year was to go around the pits in the evening while everyone was working on their cars and spread the good word from Big Sausage Pizza. She shined and was an excellent advocate. She and the other wives delivered desserts in pizza boxes to the teams, flirted with some of the drivers, and handed out beers to the mechanics. The big problem for us was after the first day of racing (it’s a two-day event with some sleep in between), our car was sitting in first place. Nobody likes a two-time winner. People wanted bad things to happen to us. That’s when my wife and her jolly band of Big Sausage girls did their job perfectly. My wife was armed with a tote bag (with a screen print of her real boyfriend, Kid Rock, on the cover of Rolling Stone) filled with ice and beer to give to the folks in the LeMons pits. On Sunday morning, our team of drivers and crew was fresh and ready to go. Some of the other teams were tired (since they were out late drinking with those darn Big Sausage girls). We led the race most of the second day. I got hit in the rear by a Racer X-themed car, which did a very Racer X thing and tried to crash me out. I somehow saved it and then regained the lead before handing the car over to my little brother. He is the thinner, better-looking Krider. He kept the lead until four corners before the end of a 14-hour long race. He was in a fierce battle with the second-place car when he rolled the car onto its roof in spectacular fashion. The dust cloud was enormous, and we weren’t sure if he was hurt. Lucky for my little bro, I/O Port Racing Supplies made sure our car had all the best safety equipment. Rob’s wife likes the races, but thinks his columns about racing aren’t very funny. You can view video of the crash at RacingWFO.com. Click Krider Racing Integra.